During infection an acute phase response is stimulated by cytokines released from macrophages and monocytes. The term 'acute phase response' refers to a non specific and complex reaction occurring shortly after any tissue injury whether caused by bacteria, viruses, surgery or trauma. The acute phase proteins produced as a result (for example C-reactive protein, serum amyloid A, alpha acid glycoprotein) are manufactured mostly in the liver and released into the bloodstream. The main function of these proteins is protection, to minimise tissue damage and to speed up the healing process. Alpha acid glycoprotein AGP is an acute phase protein which is suggested to have an immunomodulatory and anti-inflammatory role, based on its ability to down regulate lymphocyte and neutrophil responsiveness and to modulate the production of anti inflammatory cytokines by peripheral blood mononuclear leukocytes. It is classed as a moderate acute phase protein in that it only increases to a maximum of 10x normal values during inflammation. AGP has been shown to be very useful in distinguishing FIP from other clinically similar conditions. In FIP, AGP levels are usually greater than 1500 mcg/ml. In normal cats, it is up to 500 mcg/ml. In cats with bacterial peritonitis or pleurisy the AGP is also raised, which is why cytology is also necessary to differentiate these conditions. In cardiomyopathy, non-infectious liver disease and tumours, which are the most common conditions mistaken for FIP, the AGP is normal. 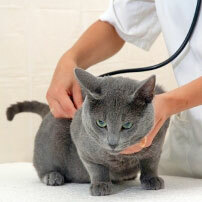 AGP is not specific, and will also be raised if there is viral (non-FIP), bacterial (e.g. ascending cholangiohepatitis or pyelonephritis) or fungal infections or recent trauma. AGP measurement is useful in distinguishing FIP from neoplasia or non-infectious liver disease, when AGP levels will be normal. AGP is not a stand alone test for FIP and must be used in conjunction with other biochemical, serological and cytological examinations, but is useful in aiding the differential diagnosis of those suspected cases where FIP is a possibility. The test is performed on serum samples (minimum sample requirement 0.5 ml) using a radial immunodiffusion method, which is incubated for 24-48 hours. We are running this test twice weekly on Tuesdays and Thursdays with results being reported on Wednesdays and Fridays.